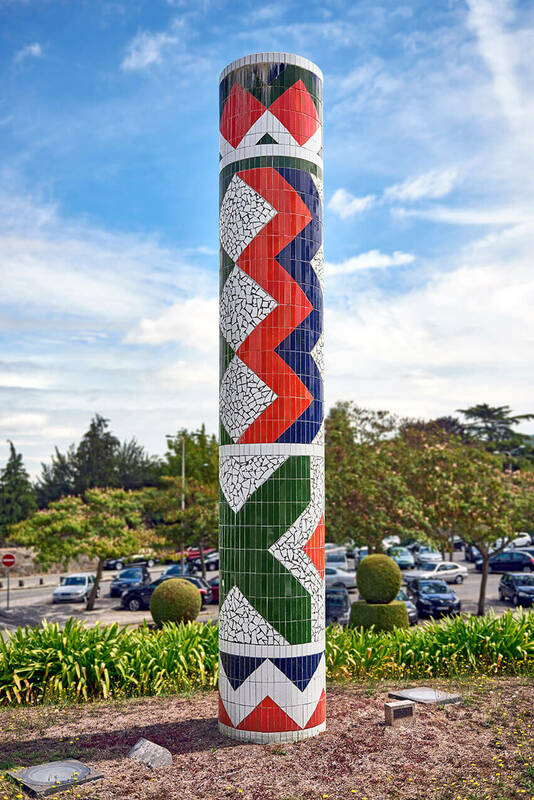 A cylindrical piece covered with patterns made of tile fragments, Guy de Rougemont’s sculpture stands out from its surroundings due to its colourful geometric design. It is a totemic volume, whose white background highlights the dynamic combination of basic, multi-coloured geometric shapes (triangles, crosses, zigzags), making this tile sculpture look like a painting in the round. Born in Paris in 1935, Guy de Rougemont attended the Paris National School of Decorative Arts in the 1950s. This initial training played a crucial role in his understanding of a variety of techniques and materials. Rougemont’s oeuvre has been strongly influenced by Pop painting, which abounds in unmixed, saturated colours producing flat, well-defined silhouettes. His iconography comprises a repertoire of images, objects and shapes taken from ordinary daily life. Rougemont’s determination to bring art closer to everyday life has resulted in several public art interventions, such as murals and monumental sculptures, as well as in stamping and object design, particularly of furniture.